The JVC BR-HD50U HDV VTR features switchable HDV and DV modes and analog outputs. Also connects to a plasma or LCD panel with an HDMI connector for use as a low-cost viewer. VTR records HDV format 720/30p/25p/24p/60p, 480/60p or 576/50p video and DV format 480/60i and 480/24p video. *Note: HDV signals must be input via IEEE-1394 connector. A sophisticated cross-converter function enables output not only of 720p signals, but also 1080i, 480/576p and 480/576i signals. Switch between HDV 60 Hz or 50 Hz, allowing recording and playback of 720/25p and 576/50p in addition to 720/24p/30p/60p and 480/60p. 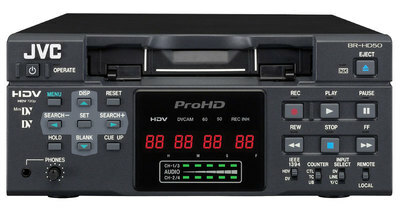 Also records to Standard DV or Mini DV tape in either HDV 60 Hz or 50 Hz base format. *Note: Cannot be used as an HDV 60 Hz/50 Hz converter. HDMI OUT -for direct digital connection to the latest high-definition projector and LCD displays. IEEE 1394 -A front panel switch allows you to switch easily between SD and HD. Large full counter: A big 8-digit LED display on the front panel displays time code, user bits and VTR status. Time code reader/generator with preset, rec run and regen time codes. The DV 20x search function (100x max. in the FF or REW mode) and the HD 8.5x forward search function (6.5x in reverse), provides super-fast access to any desired point on the tape. When a camcorder is connected to the BR-HD50 via the IEEE 1394 connector, the BR-HD50 will start recording 5 minutes before the tape in the camcorder ends, enabling continuous shooting for extended periods with no breaks in the recording. Rent the JVC BR-HD50U HDV Deck from Deck Hand Camera Rentals Today!